Blood: it’s generally associated with life and vitality. The sight of it can send some people into an all-out panic attack, but the basic tenant of the substance is surprisingly simple (yet, it can yield a plethora of useful information about your overall health). Simply put; blood is bodily fluid found in animals. 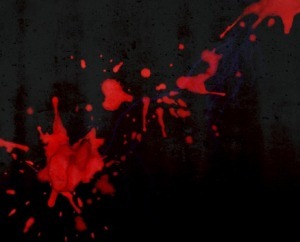 In this article, we will delve right into what blood actually is, what it’s made of and how it aids bodily functions. Hopefully, at the article’s completion, you will understand how your body works a little better. Blood is essential fluid in the human body because of its vital role in delivering oxygen and nutrients to body cells, while carrying away any toxins and waste. In combination with vascular system, it helps keep the temperature of the body stable. When it’s hot, your veins expand, so that more blood comes to the surface of the skin, allowing hot blood to cool down, before allowing it to continue coursing throughout the body. And when it’s cold, the veins shrink so that the warmth stays inside your body, instead of flowing outward. Blood is made up of two main components: plasma and cells. Plasma, comprised mostly of water (with bits of different proteins, fat and salts), is the liquid component of blood. It serves as a medium for the transportation of nutrients, waste products, hormones and blood cells. Similarly, the cell portion of human blood is made up of many different types and subtypes of blood cells, with the main three being erythrocytes (red blood cells), leukocytes (white blood cells), and trombocytes (platelets). Red blood cells are the most common type of cell found in blood. They contain a protein called hemoglobin, the substance that gives blood its deep red color, that binds the oxygen and the iron (a crucial component of hemoglobin). Furthermore; they are responsible for transporting oxygen throughout the body. If a person is anemic, his or her blood doesn’t contain enough erythrocytes, or the hemoglobin is somehow damaged, losing its ability to bind oxygen and transport it through the body. Then, we have white blood cells, which are a part of the immune system. When the thread occurs, a number of leukocytes in the stream will increase. They fight the threads on different levels. They can, for example, produce antibodies that will fight the infection, or they can ”eat” whole bacterium. Leukemia is the disease that affect white blood cells (eg. overproduction of abnormal white blood cells) that can cause problems on many different scales, especially when it comes to fighting infections and diseases. Next, we have platelets. They are tiny (smaller than red and white blood cells), disk shaped cells that help the blood clot. If the number of platelets is too high, this (in combination with other factors, like high cholesterol) can lead to the formation of blood clots, that can travel through the blood stream and clog smaller veins, resulting in different dangerous states, such as a stroke or aneurysm. 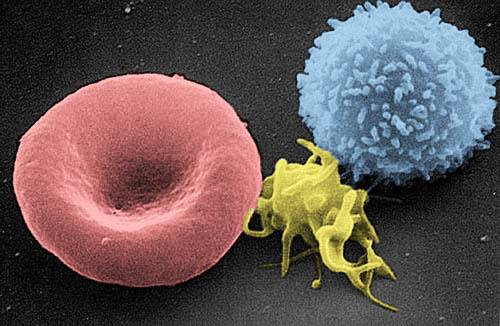 These are the main three cell types in human blood. But as you probably know, not all blood is the same. It is actually categorized in blood groups or types. There are four blood groups: A, B, AB and 0. The blood types are determined based on the presence (or absence) of inherited antigens in the red blood cells and antibodies that make up the plasma. As shown in the table on the right, the blood group A contains red blood cells that have an A antigen on the surface. In the plasma, anti-B antibodies are found. Anti-A bodies will react with A antigens and cause blood to coagulate. This same principle applies to all blood types. And that is the reason why blood type is so important when it comes to giving and receiving donated blood. If the wrong type of blood is used, it can lead to heavy – sometimes life threatening – complications. Using this logic, you can also see why type 0 blood is the universal donor — it doesn’t have antigens and will subsequently not cause reactions if mixed with other blood types. Type AB blood is called the universal recipient, as the person with it can receive any other blood type without causing immune reaction (due to the lack of antibodies). In reality, things are not nearly so simple. Even blood types cannot be simply put into 4 different boxes. There are other things to considerate, such as Rh factor. In conclusion, the human body is extremely complex and so it is blood. It contains different hormones, cell types, different types of cholesterol, etc. All of which, work together to control most other bodily functions. Hopefully knowing all of this will inspire you all to do some further research. Check out our awesome “Know Your Blood” infographic here. Cosmic Orbits: What Do We Find Orbiting a Black Hole?